With a stay at Hotel Sercotel Alfonso VI in Toledo (Toledo City Centre), you'll be steps from Alcazar and 6 minutes by foot from Toledo Cathedral. 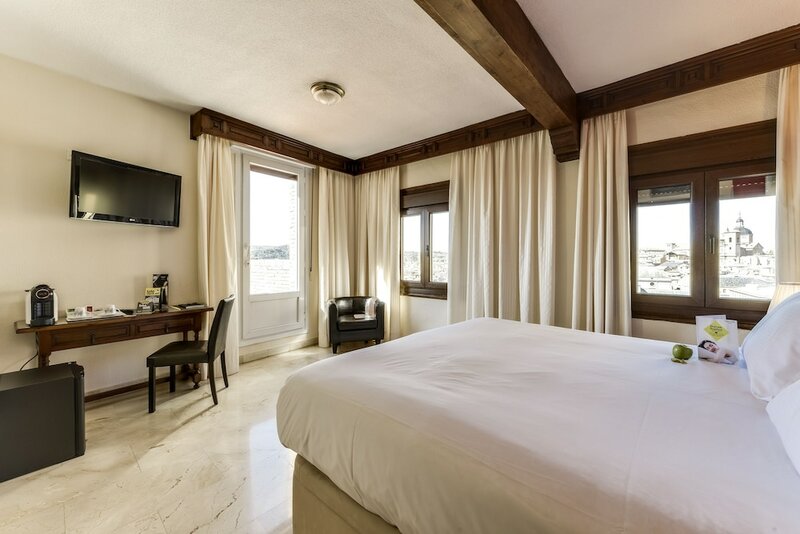 This 4-star hotel is 0.6 mi (1 km) from Puerta de los Doce Cantos and 0.6 mi (1 km) from Puerta de Alcantara. Make yourself at home in one of the 83 air-conditioned rooms featuring minibars and LED televisions. Rooms have private balconies or patios. Complimentary wireless Internet access is available to keep you connected. Private bathrooms have deep soaking bathtubs and complimentary toiletries. For lunch or dinner, stop by Restaurante Alfonso VI, a restaurant that specializes in Spanish cuisine. Dining is also available at the coffee shop/café, and room service (during limited hours) is provided. Wrap up your day with a drink at the bar/lounge. Breakfast is available for a fee. In accordance with national/local laws, air conditioning may be restricted to certain hours from 01 June to 01 October.